Anchored in Ayr Bay for a few days is a Russian destroyer, RFS SEVEROMORSK, here to take part in a commemorative service for another Russian ship which has local connections. This was the cruiser VARIAG, which has a fascinating history. Her full story is recorded here, and her final resting place was just a few miles south of Ayr at Lendalfoot, where she ran aground in 1920 while under tow to a German scrapyard. The Royal Navy website also covers the story of VARIAG in detail. 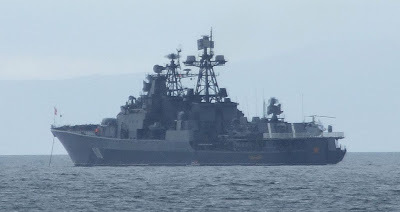 SEVEROMORSK is a member of the 'Udaloy' class of ships, and is fitted with 2 3.9" guns forward, 2 quad torpedo tubes, 2 sets of 2-tubed anti-submarine mortars, two sets of surface-to-air missiles, as well as various other smaller weaponry. Built in 1987, SEVEROMORSK was previously named SIMFEROPOL, and before that MARSHAL BUDIENNY. Of 8,500 tonnes displacement, she is 163.5 metres long and her gas turbine machinery can move her along at some 29 knots.